From Wahweap Campground at Lake Powell, Page, Arizona Boating is the main attraction of Lake Powell. The six of us have been planning a day on the lake since we first put this destination on our agenda. We found a $375 daily rate (plus fuel) for a 26' Deck Boat at Antelope Point Marina, about 15 miles from Wahweap. After a telephone inquiry, we visited the marina to see exactly what we were going to rent. First thing to catch our eye at Antelope Point Marina Boat Rentals, however, were the rental houseboats. All open for our inspection, we looked in several of them. This one fit our style and was a group favorite. The open, upper deck of the houseboat. Living quarters are below. It has four bedrooms and two baths. That's Charlie, Pam, Joyce, Ernie and Wayne, left to right. Pam studies the instrument panel while Ernie gets comfortable in the living area of the houseboat. The next larger size has a jacuzzi on the upper deck. This one doesn't. 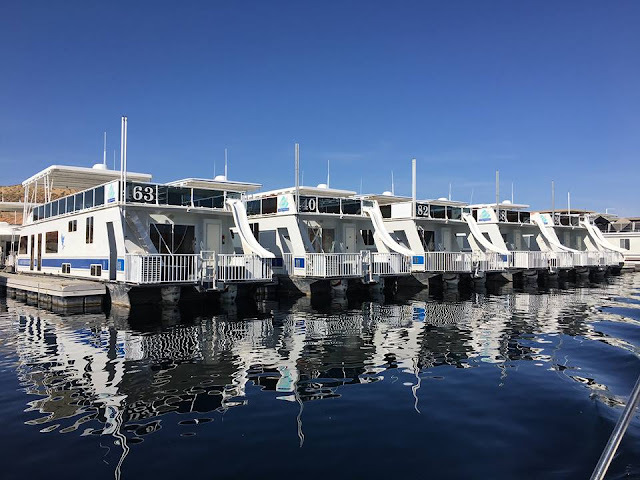 However, with a minimum 3-day rental (at $3000 a day) on the houseboats, we all regained our senses after a while and proceeded to reserve the 26' pontoon as originally planned. We had a small window of good weather -- meaning no rain or wind for our target boating date. We hope to get to the difficult-to-reach Rainbow Bridge National Monument, nearly fifty miles up the lake from Glen Canyon Dam. A far cry from the 50' houseboats, these 26' deck boats that seat 8, are a better choice -- and lots less money. 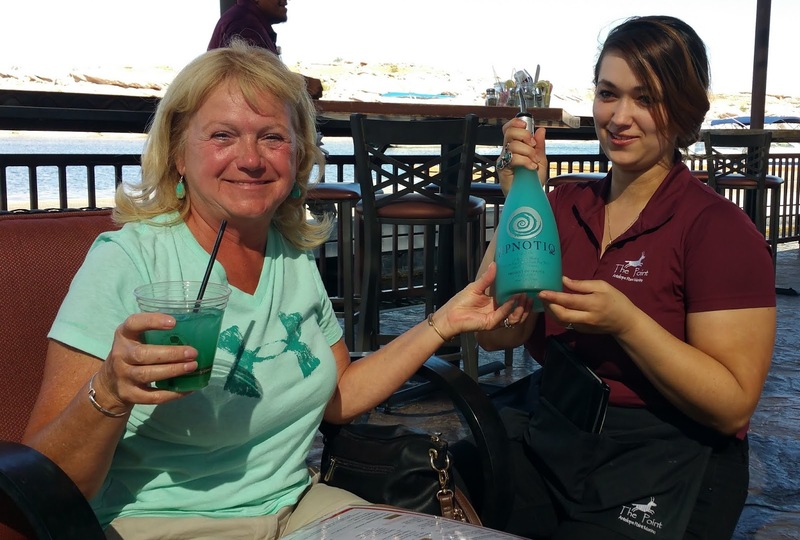 A visit to Antelope Point Marina isn't complete without a stop at the Marina Village Restaurant where we enjoyed drinks on the patio after our boat rental business concluded. Left to Right: Ernie, Charlie, Joyce, Wayne and Pam at Antelope Point Marina Restaurant's patio bar. Left to right: Joyce, me and Pam at Antelope Point Marina Restaurant patio... with our drink assortment. 4 drinks for 3 ladies... Hummm. Mine is the blue one... delicious... called Lake Powell H2O and it packed a real punch. Those who know me know I don't drink much. Very rarely, in fact, do I consume liquor. No real reason. This afternoon, however, I had a drink -- one drink, about 14 ounces of a concoction listed on the menu as "Lake Powell H2O". Afterward, I became uncontrollably silly and entertained our friends with outrageous antics for several hours. Fortunately my inebriation did not result in a headache or hangover. This picture of Pam and our waitress was taken a few days after our boating trip. So on Thursday, April 21st, we returned to Antelope Point and our waiting deck boat. Pam, Joyce and I had divided the picnic food responsibilities for the all day outing. Needless to say, there was enough to feed a small army. Lucky for us, Antelope Point offers a valet service, transporting us, and all our stuff, from the parking lot, down this mile long ramp to the boats. I am sure we looked like we were going for a week of boating instead of a day trip. Antelope Point is on the original Colorado River channel and was at 40% capacity. Water depth is 450 feet. It took a long time to get underway as the required boating orientation revealed problems with the engine that necessitated a vessel change. When we complained at the delay, the agency gave approval to make up the lost time at the the end of the day. Pam's part of today's food extravaganza included mimosas and breakfast breads. The weather was perfect, warm and sunny. We nibbled on bakery goods and sipped on mimosas as we slowly moved through the "no wake" zone. Wayne took the first turn at the helm over calm water. Pam is ready to pop the champagne cork as Joyce and Ernie look on. Boating on Lake Powell was unlike, and better by far, than any boating I think I've ever done. Along the shoreline you see no homes, private docks, billboards, automobiles, or roadways. Just beautiful, majestic rock cliffs and unusual geological formations reaching out of the lake. It's like being on another planet. While the morning was warm at the marina, the air temperature dropped once we were on open water. One by one we covered our exposed arms and within minutes, we were wrapped in blankets as Wayne picked up the boat speed. Notice the tiny boat in the water to the right of the rocks. After a while, Ernie took his turn at the wheel of the pontoon. A couple of hours into our trip to Rainbow Bridge, we followed the markers out of the channel to Dangling Rope Marina. We would need a fuel refill for the trip. Again, no roads lead into or out of this marina. It is accessible only by water. The attendant told us the fuel here is delivered via the waterway. Captain Ernie checking for "all systems go". Dangling Rope Canyon and Marina. Forty-two miles up the lake from Glen Canyon Dam, thirty-seven miles from Antelope Point Marina. In the more open areas of Lake Powell, the wind came up a bit and at one point, crossing the wake of an oncoming power boat, Wayne, standing as he is in the picture below, lost his footing and fell. His fall resulted in spilling an important commodity -- a half mimosa. I thought someone might try to lick it off the boat seat. Lexie and Ozzie enjoy boating. Pop is always close by... even when he falls. Our route took us quickly across the state line from Arizona into Utah, traveling across Padre Bay, passing Last Chance and Rock Creek Bays. We had beautiful views of Gunsight and Cookie Jar Buttes, Miner's Stairs and The Grand Bench. We passed Face Canyon, West, Dungeon, Grotto and Wetherill Canyons without stopping in to explore any of them. Just not enough time. Our destination is expected to take several hours to reach. A fairly good hike awaits us and we will have to break for lunch too. We expect to have just enough time to get to Rainbow Bridge, hike, eat and get the boat back to Antelope Point Marina. Another thing that doesn't work properly on our deck boat is the head (toilet). Interestingly, Lake Powell has floating toilets. Luckily we didn't need a independently floating toilet as we used the one at Dangling Rope Marina. Around noon, we reached marker 49 that would take us, slowly and carefully through the deep walled, sometimes narrow canyons to the dock at Rainbow Bridge. A very special photo locale for Lexie, Ozzie and me as we carefully manuver the canyon. To our surprise, thrill and amazement, there was but one boat at the dock when we arrived and these three visitors were boarding their boat to leave when we arrived. Not another boat, nary a single, solitary soul joined us at the dock or at our visit to Rainbow Bridge. It's the only National Monument I ever recall visiting without other tourists. Being the generous and giving husband he always is, Wayne offered to stay aboard the boat with Lexie and Ozzie while I joined Pam, Ernie, Joyce and Charlie for the 2.5 mile round trip hike from the dock to see Rainbow Bridge. Reluctantly, I agreed. Wayne knew I wanted to see this site since I heard about it on our first trip to Lake Powell. I hurried ahead of the others, walking fast and alone, frequently scared about what wild life I might encounter walking in this uninhabited land. It was scary. I breathed heavily, coughed often, stomped my feet and sometimes whistled loudly as I walked. I reached Rainbow Bridge before the others and then I returned sooner so Wayne wouldn't be alone too long with Lexie and Ozzie, who were not allowed to walk on the dock. Looking back from the trail head toward Wayne, Lexie and Ozzie, waiting for me at the boat. My first glimpse of Rainbow Bridge. The lake is dry here. In years past (before the recent drought), boats could reach this point, making for a much shorter hike. Today we hiked about 1.3 miles each way. The air in the canyon is still and hot. Snow remains on the peaks of 10,388 ft. Navajo Mountain in the background. Some history of Rainbow Bridge: In May 1910, President Taft created Rainbow Bridge National Monument. Former President, Theodore Roosevelt and Zane Grey were among the earliest travelers to make the weeks-long, arduous trek from Oljeto or Navajo Mountain to glimpse the Rainbow Bridge. In the late 1940's, military rafts from World War II made visiting Rainbow Bridge a bit easier, taking several days instead of several weeks. The raft trip ended with a seven-mile hike up-canyon to reach Rainbow Bridge. By the 1950's, motorboats from Lees Ferry carried visitors to see Rainbow Bridge over a period of just 3 days! There is a viewing area beneath Rainbow Bridge. But then, the Glen Canyon Dam gates closed in 1963 and Lake Powell began to engulf the river and canyons. Higher water made access to Rainbow Bridge easier. Thousands flocked to see it. In 1974, Navajo tribes of this area filed a lawsuit to preserve important Navajo religious sites like Rainbow Bridge, but the courts ruled against them, saying the need for water storage was more important than their religious concerns. Six years later, in 1980, the Tenth District Court of Appeals ruled that to close Rainbow Bridge, a public site, for Navajo religious ceremonies would violate the U.S. Constitution, which protects the religious freedom of all citizens. Then in 1993, a National Park Service management plan was adopted that offered a long-term plan for mitigating visitor impact on Rainbow Bridge. With input from the Navajo, Hopi, San Juan Southern Paiute, Kaibab Paiute and White Mesa Ute tribes, the National Park Services agreed to ask visitors to be respectful of the significance of Rainbow Bridge to the Native American People. That's the best we could do? That's the least we can do? I felt guilty to intrude here. Following our hike back from Rainbow Bridge, we ate a small portion of the mammoth lunch and then began thinking about the long trip back to Antelope Point Marina. Charlie took the boat's wheel for the return trip and he pushed the throttle forward. The afternoon air was really cool. I wrapped Lexie and Ozzie in the blanket that covered my legs and arms. They slept almost all the way back. We did not exercise our option to extend our boat rental. We all were too tired. Our day trip to Rainbow Bridge was timed perfectly. Winds came by the next day and I don't recall having another day suitable for boating on Lake Powell during the remainder of our stay. Happily, the next day, our friends from Camp Verde, Sherry and Dave, will be joining us for a few days.